Includes a ready to fly factory built UAV Mapper, Pixhawk flight controller, airspeed sensor, Taranis X7 radio and L9R long range receiver, Mars Mini parachute, two 6000 mAh 4S Lipo batteries, basic Lipo charger, two spare propellers, and reusable shipping box. Includes camera mount, trigger cable, precision geotag feedback cable. Sequoia option only includes micro USB power cable. Camera and PC not included. Includes a Ready to Fly UAV Mapper with Sony mount, one pre-programmed Emlid Reach module, ground plane, Reach time event cable. You will still need a second GNSS receiver that outputs RINEX data. You can use a second reach module, Reach RS, or your survey grade receiver. A camera is not included. You can order the NEX5 with 16mm lens below or use your own NEX5 or a6000. Do it yourselfer aerial mapping plane kit. Requires all electronics and software. Replacement body with coroplast, motor mount, and hook velcro installed. Replacement wing, ready to fly. Includes servo. Just install on airplane. Choose front or center spar. Fits UAV Mapper body. You can deploy the parachute at will using a switch on your RC transmitter. This makes it easy to land on harsh surfaces or save your UAV in the event of a failure. Also requires parachute mounting plate. Installation documentation. 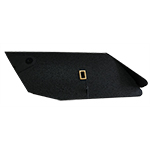 Includes laser cut velcro for mounting to the top of your UAV Mapper body. Sony NEX5, SEL16F28 lens, hot shoe adapter, high speed 16GB SD card, battery and charger. 60 day warranty - USA only. Fits UAV Mapper servo mounts. 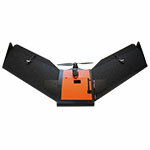 You need two for the UAV Mapper kit. We pre-program to enable brake, disable low voltage cutoff, setup in fixed wing mode and solder on an XT60 connector so it's ready to go in a UAV Mapper. 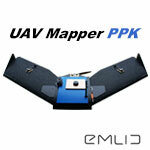 Use with the UAV Mapper. Includes prop adapter ring. 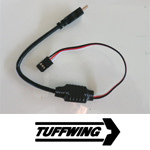 Failure to use a prop adapter ring will result in excessive vibrarions which may cause your UAV Mapper to crash. 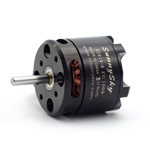 Reliable, lightweight brushless motor for the UAV Mapper. Fits predrilled motor mount holes. Includes X mounts and prop adapter. 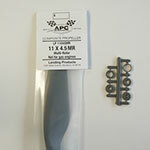 Use with 4S battery and APC 12x6 propeller. Connect an Emlid Reach GNSS receiver to a Phantom 4 Pro. 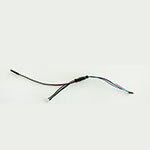 Camera trigger cable for Pixhawk to CHDK Canon PowerShot. 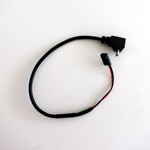 If you're using Pixhawk GPS points to trigger a Canon PowerShot running CHDK, then you need this cable. 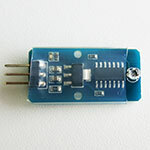 This solves the Pixhawk 3.3 volt "problem" by replacing the 3.3 volt Pixhawk signal with 5 volts from the + pin. 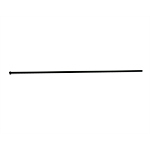 Read this to see if you'll need to add a UBEC (purchase below) to your copter. Airplanes don't need a UBEC. Get accurate geotags with this feedback cable connected to your CHDK enabled Canon point and shoot. Instructions. Trigger two Canon CHDK cameras at once. Perfect for your NDVI and survey camera. Read this to see if you need a UBEC. Trigger your Sony Nex 5 or a6000. 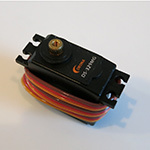 Also includes 15cm male to male servo cable to connect to your Pixhawk. Instructions. 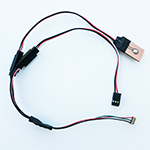 Get accurate geotags with this feedback cable connected to any camera with a hot shoe. Instructions. Connects to your camera's hot shoe. Powers your Reach Module. Reach Modules consume up to 500ma at 5 volts. Adds time marks to your Reach RINEX files and Pixhawk log file. Displays picture icons in Mission Planner to verify that your camera is in fact triggering during flight. 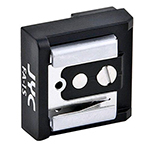 Plugs into the Accessory Port on Sony Nex 5 cameras and allows you to add a hot shoe precision geotag cable. Instructions. Sequoia cameras don't have batteries. They are powered by your UAV's battery. 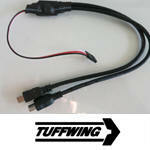 This 90 degree UP angle micro USB cable picks up 5 volts from any open RC or Aux port on a Pixhawk. Read this to see if you'll need to add a UBEC your copter. Airplanes don't need a UBEC. 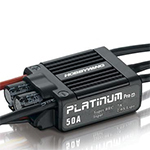 If you're buying a trigger cable for your copter you need to make sure you have a 5 volt power source on your Pixhawk rail. Read this to see if you need a UBEC. "IN" must be soldered to your flight battery, "OUT" must be soldered to the included donor servo cable. 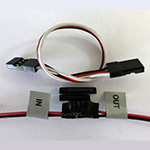 Connects a Micasense RedEdge or RedEdge M to a Pixhawk. 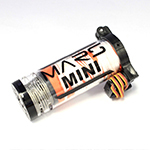 Provides power from the UAV's ESC or BEC that is already connected to the Pixhawk. Instructions. 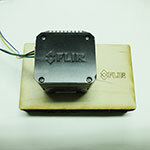 Connects a Flir Vue Pro to a Pixhawk. It triggers the Flir and geotags the images with GPS data from the Pixhawk telemetry port. Instructions. CNC cut EPP foam and coroplast camera mount for Sequoia or any GoPro form camera. Attaches to UAV Mapper body with Velcro. CNC cut EPP foam and coroplast camera mount for Canon S110 or S100. Includes cut out for precision geotag cable and glass lens cover. Attaches to UAV Mapper body with Velcro. Laser cut coroplast camera mount for Sony cameras. Includes cut out for IR trigger cable and glass lens cover. Attaches to UAV Mapper body with Velcro. CNC cut EPP foam and coroplast camera mount for Micasense RedEdge camera. Includes camera side Velcro and glass lens cover. Attaches to UAV Mapper body with Velcro. RedEdge UAV Mapper setup instructions. 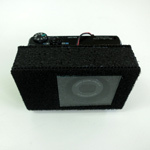 Laser cut light ply, CNC cut EPP foam and coroplast camera mount for Flir Vue cameras. Attaches to UAV Mapper body with Velcro. Flir Vue Pixhawk setup instructions. 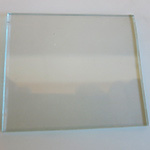 2" x 2.25" x 3/32" plate glass for all UAV Mapper camera mounts.